In a large bowl, combine the sweet potatoes, rosemary, 2 teaspoon of oil, salt and pepper. Transfer to a rimmed baking sheet and bake until tender, 25 to 30 minutes. Meanwhile, in a large skillet over medium heat, warm 2 teaspoons of oil. Add the onion, bell pepper, garlic and a pinch of salt and cook, stirring occasionally, until the onion and bell pepper are tender, about 5 minutes. Add the mushrooms and thyme to skillet and cook, stirring occasionally, until the mushrooms begin to soften, 3 to 4 minutes. Transfer the vegetable mixture to a large bowl, cover to keep warm and set aside. Return the skillet to medium heat. Add the sausage and cook, breaking it up with a spoon or spatula, until no longer pink, about 4 minutes. Cook without stirring until browned on the bottom, about 2 minutes. Gently turn the sausage and cook without stirring until the other side is brown, about 2 minutes. Add the sausage to the bowl with the vegetable mixture, cover to keep warm and set aside. Add the sweet potatoes to the bowl with the vegetable mixture, cover to keep warm and set aside. Wipe out the skillet and use it to cook the eggs as desired, adding salt and pepper to taste. 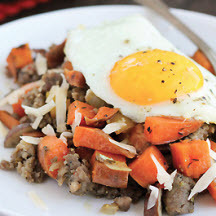 Arrange the sausage mixture on plates, top with the cheese and eggs and serve.